← Ornament Gifts Ideas That Your Friends, Family, and Co-Workers Will LOVE! 2017 was a year filled with success, challenges, and surprises, all wrapped up into one. As we enter in the New Year, let’s not forget the hard work and dedication your employees have put in and remind them of the success and growth that their attributes have brought to this company. Recognizing your employees’ strengths and outstanding performances is not only an expression of gratitude and honor but also a gesture of encouragement and motivation for 2018. Nothing is more honorable and prestige than the classic award. Choosing the right style to fit their achievements is crucial in expressing how you value your employees. With the right style of award paired with a few simple personalized words, your appreciation and recognition will be a forever reminder to your honorable employees. To the employees who have exhibited star performance and are the highest ranked, the star and diamond awards are the best reflections of their achievements and the impact they have on the company. The Star Obelisk Award has the stature of a leader and a star to emulate one’s outstanding achievements. Engrave their name, company logo, achieved title, and a few short words expressing your gratitude. With these few texts etched on the front of the award, your employee will always have something to carry around and be proud of throughout their entire professional career as well as their personal journey. Each company requires a sense of creativity and individualism in order to achieve greatness among all of the competition. Represent your creative employees with an art-inspired award. Just like art, no employee is like the other. Find the best abstract art glass or sculpted figure to replicate the uniqueness of each one of your employees. You can present the Art Glass Green Double Helix Award to those who have contributed to the company with the most original ideas/content. Give the Art Glass Harmony Award to those who have formed a great team of inspiring visionaries through leadership and inspiration. For a more symbolic form of recognition, award your artistic leaders with sculptures or figures like the Key to Success or the Soaring Eagle. 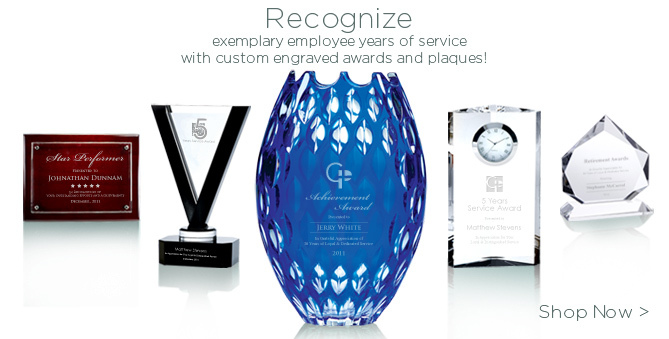 Whichever way you choose to recognize your employees, you can personally engrave each and every one of your art awards with their names and well-earned title to show that their contributions are greatly prized and treasured. Aside from all of the uniquely made awards, there is nothing more classic than an award plaque that can either be hung proudly on a wall at the office or on top of one’s desk. With the Rosewood Piano Finish Plaque, you have a large platform for engraving. You can engrave an employee’s name, company logo, employee title, and a short message, all etched in big letters to be acknowledged by the whole office as it hangs on the wall of success. Desktop plaques are also a great way to remind your employees of their value in the company. The Vertical Rectangle Plaque is wedged to keep the plaque supported and standing so that your personally engraved message can always be glanced at by your employee. Personal gifts are also an excellent way to recognize your employees’ achievements. A great way to make their recognition a constant reminder is making it visible in their professional and personal lives. Personal gifts can range widely from vases, to bowls, to desk accessories, and even to clocks! Find items that can keep both a corporate and casual image like the Waterford Crystal Vase, which can be engraved and used to furnish a home. For the office however, you can personalize the Crystal Single Silver Pen Set for your employee that they can place either at their work or home desktop. Personal gifts like the Black Roman Arch Clock have a sophisticated and classy appeal that can be used in almost any setting. Make each gift distinct with a personal message to remind them of your appreciation everyday. There are infinite possibilities when it comes to showing your gratitude for your employees. Regardless of what method you choose, your thoughts and intentions will be shown through the meaning of the award and the personal message you’ve engraved on it. Each award is as unique as your employees, and they deserve to know it. So let’s start off this year new right by spreading positivity, encouragement, and appreciation as we look forward to more success and accomplishments in the future for you, your employees, and your thriving company!